Warmlite range of stormproof timber windows gives you an almost unlimited choice of options with very high performance. Stormproof casement windows were introduced post-war so if you are replacing windows in a property built prior to that, it would be better to view our flush casement windows. Our stormproof casement windows can be adapted to replicate traditional period window styles based on our wide range of design and layout options as well as our extensive glazing, timber and paint options. Our windows benefit from high quality hardware, excellent thermal performance and enhanced security features as well as benefiting from our 10 year guarantee. Multipoint locks Fitted as standard, providing multiple locking points along the opening sash and also shoot bolts into the side of the frame. In addition to excellent security performance, these fixing points prevent the timber from moving, contributing to the long life of the window. All Warmlite’s stormproof timber windows are covered by our 10 year guarantee. This gives you the peace of mind that in the unlikely event something should go wrong with your stormsproof timber windows, you can get them fixed quickly and conveniently at no cost to you. The guarantee covers material defects in profile materials, panels and glass units. 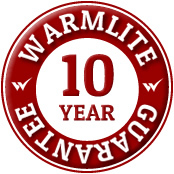 In the very rare event that a problem develops with your stormproof timber windows during the ten year period, Warmlite will simply replace the affected product. The egress is the easy clean hinge option allowing the window to be opened to a 90 degree angle making it easy to clean and usable for escape purposes. In addition it allows the sash, when in the open position, to slide towards the centre of the opening allowing the outside to be accessed for cleaning. Reversible hinges allows the window to be completely rotated so that the outside of the glass is on the inside, for easy cleaning. For further information about our robust and secure stormproof casement windows, a free site survey with a no obligation quotation or to arrange an appointment.